Karachi 9th January 2016: Supermeal.pk (an online food ordering website) held a mega event at New York Coffee to celebrate Jeeto Superstar Ka bat with Shahid Afridi. As many as 15 lucky winners (participated in an online gameplay during World Cup 2015 on www.supermeal.pk) who met Afiridi and Anwer Ali. They were awarded with Superstars’ Bat signed by 7 cricket superstars followed by lunch. These superstars includes; Shahid Afridi, Younus Khan, Sohaib Maqsood; Sarfaraz Ahmed, Yasir Shah, Sohail Khan, and Irfan Khan. Supermeal.pk celebrates World Food Day – Be Super, Fight Poverty! October 16, 2015, Karachi: Supermeal.PK celebrated WORLD FOOD DAY in collaboration with Pizza Today, Iqra University North Campus & Shahid Afridi Foundation at Pizza Today to mark their initiative towards ending poverty. This is one of the first kind of CSR initiative taken by an online food portal to spread awareness amongst the society and call for action campaign on how to end poverty in the society. The theme for this year by Supermeal.pk is; BE SUPER, FIGHT POVERTY! 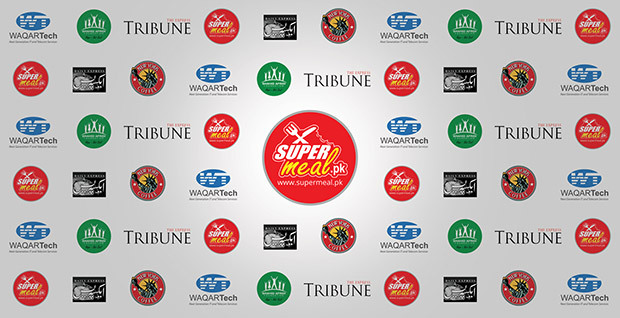 Karachi (February 04, 2015): At the outset of the World Cup 15, Supermeal again comes up with a grand cricketing competition online named ‘Jeeto Superstars Ka Bat’ wherein each and every bite will lead you towards winning the opportunity to meet cricket Superstars and other amazing prizes in a flash. Supermeal’s ‘Jeeto Superstars Ka Bat’ happens to be a series of online cricket festivities officially celebrated by Supermeal during major cricket tournaments each year. Last year in March 2014, Supermeal.pk (formerly Foortal.pk) launched ‘Foortal BOOM BOOM T20’, an online gameplay so as to intensify the national cricket fever in Pakistan during T20 Cricket World Cup 2014. Providing cricket buffs with a unique opportunity to those foodie couch potatoes, who also happened to be the born cricket freaks, to test their acumen and prediction skills out of their wild guess instincts. Top 50 winners enjoyed an evening with Shahid Khan Afridi on 26th April 2012 in Karachi. This time, it’s on a bigger spectrum. The winners are going to claim more than a world cup trophy. It’s a Superstars’ BAT! The bat of leading and emerging cricket stars (including Shahid Afridi, Younis Khan, Sohaib Maqsood, Sarfaraz Ahmed, Muhammad Irfan, Yasir Shah and Sohail Khan). In addition to this, there are hand-signed balls by Shahid Afridi. No, No, this is not it. The best is this; at the end of the tournament Top 10 scorers will be invited to have a grand dinner with these super stars. What’s more can you think of other than the above? It’s a million dollar opportunity. Being a socially responsible organisation, team Supermeal will donate 10% of your every order to Shahid Afridi Foundation’s charity funds. Again, merging the never-ending delight of food and cricket together, Supermeal.pk offers you an opportunity to relish the best food while enjoying nation’s favorite game. Thanks to Supermeal World Cup 2015, it is always better to act on a hunch, whether dining out with your friends or craving for today’s lunch. So, what are you still waiting for? Make it snappy!